Do you love cup of instant noodle ? Then good news: Here's my way to get your noodles fix while also upgrading it to be more delicious and packed with fresh ingredients. The idea is simple and genius: combine par-cooked noodles, a bit of vegetable base, some raw sliced veggies, and a few seasonings inside a jar. Add boiling water, wait a few minutes, and you've got yourself a lunch with all the appeal of instant noodles, but with actual flavor and freshness trapped under that lid. We get all the benefits of instant noodles when it comes time to eat (convenience and portability), but also can control exactly what goes into our lunches, avoiding too-salty or overly MSG-packed broth and getting bigger bits of vegetables. Kenji offers several examples to get you started (Spicy kimchi beef flavor instant noodles! Thai coconut curry shrimp flavor instant noodles! ), but more important are his tips for making your own flavors. Two tips stood out to me: Better Than Bouillon, one of our favorite ingredients for saving time cooking, makes for a great soup base. 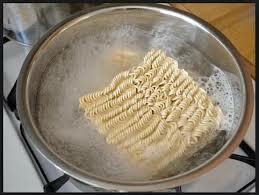 And second, select specific noodles to make this work. Uncooked ramen or Italian pasta will come up mushy and gummy, but rice noodles, par-cooked noodles, and no-cook noodle alternatives will do well. You can find these in Asian supermarkets or the Asian aisle of the grocery store. Alternatively, you can cook other noodles like ramen—including your DIY ramen—until slightly underdone.